The following details were published here in 2002 to coincide with Matthew Schreiber's exhibition at Gallery 286. Matthew Schreiber is a Miami-based artist whose current work is principally produced in the form of holographic stereograms - moving holograms derived form video and film-based imagery. He trained at the Art Institute of Chicago and the Royal College of Art in London and when not creating his own work, assists James Turrell on international projects. My subject of CPR (Cardio Pulmonary Resuscitation) has held my interest for the past year. 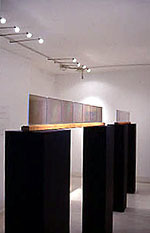 I consider the work in this exhibition as finished pieces and as studies for a larger work to be completed in 2003. 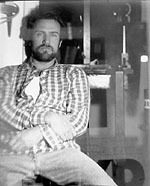 In July of 2002 I began an Artist Residency at Cold Spring Harbor Laboratory in New York. The lab (presided over by James Watson as in Crick/Watson Double Helix discovery) specialises in Genetic Research and Neuroscience. At the lab I have begun research that will result in several short video interviews. In December I will return to the Lab to start the second portion of research and clarify a collaborative project for the exhibition. CPR and more specifically, Life Support Systems, will be the focus of the work. This piece was made specifically for the Red Gallery with materials brought from America, borrowed from friends in London and found here in the garden shed. Every piece of the object has a specific function, the result being that the balloon slowly fills and then exhales air. The balloon itself is a switching device. I shot Digital Video of my wife Benedicte and some neighbours play-acting scenes from two movies. One side of the holograms show The Guys Chest About To Explode from Alien. 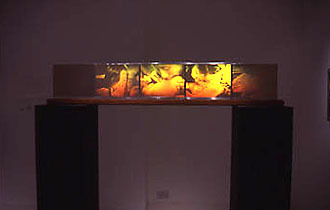 The other side is the Revival Scene from The Abyss. stereogram. How does the narrative fall apart and how does it read backwards? 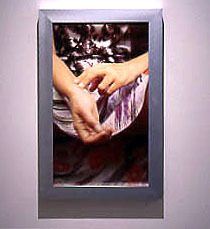 How can the viewer relate to the gaze? how the same images would have different content according to their location. 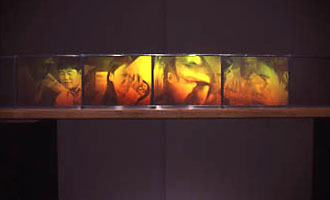 producing large format back-lit images as 3D stills from my video and holographic work. the length of the piece or the editing. I have an evergrowing collection of CPR scenes from the movies. Right Now I have 35. The loop is 11 min 20 sec broken and After the CPR. I will make several versions of this loop as I increase the collection of scenes. The actual subject of CPR Studies grew out of watching many of these movies. Here is a survey from my CPR Movie Collection of monitors. I coloured the video to move up and down the spectrum over time. 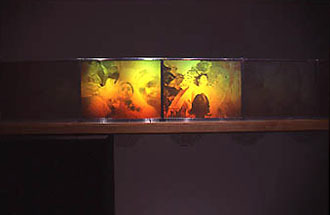 ARCHER, 2001, a four plate work, is part of the Jonathan Ross Hologram Collection.